Click the button below to add the -RUD Grip 4x4 Truck Tire Chains(1 Pair) -Simple. Sturdy. Great Value to your wish list. *Chains are refundable. Please be sure to read our returns policy. With any tire chains retailer, fitment for the indicated tire sizes is likely, but not always a match. This is due to occasional differences between how tire manufacturers measure the dimensions of their tires. Accordingly, the nominal sizes they designate on their sidewalls may be the same across manufacturers, but for tires that are significantly different in actual size. These most popular and easy-to-install truck tire chains are made for 4WD, 2WD and AWD pickups, SUVs and vans. Proven in the field by truck "gearheads," driving professionals and trainers such as Bill Burke, Overland Journal and Viking Offroad, these German-engineered chains are respected by people in the know as a superior choice. The details of why these chains are a better choice can be read by clicking the text expansion link at the bottom: "RUD GRIP 4X4 TIRE CHAINS INFO." Check the buzz in online forums. Do a Google search for "best 4x4 tire chains" and you will find RUD chains mentioned among the best. Notice, however, the large price difference you'll find between RUD chains and the other "best chains." Here at Chain STOP you're getting chains of equal or better value than those you'll see hyped up on top 10 lists that "cozy up" to Amazon and high-priced retailers. While of equal or better value, our chains are consistently priced at a fraction of the others, especially when you purchase two or more pairs. The chains we sell are priced relatively low, but they are high-quality German-engineered chains NOT to be confused with the very cheap imitations that will break after a few uses. Get the chains and once you see the quality, service and value you received, don't leave your family and friends "in the cold"....put the word out that Chain STOP offers the real deal at an excellent price. Above, there are several options required to select to complete your purchase. One of these options is your choice of promotional offers for discounts when you purchase tire chain accessories with your tire chains. The kits include accessories recommended for corresponding quantities of pairs of chains (e.g., recommended you buy kit 1 for 1 pair of tire chains, kit 2 for 2 pairs, etc.). Below, please see the brief explanation for each option. If you have any questions, please call us at 515-897-1789 or e-mail us at cs@chainstop.com. Select your tire size. If you do not see your tire size in the drop-down list, please click ChainSTOP.com's Contact Us link and ask whether we have your chain size available. One pair of Grip 4x4 chains retails at $153.49. Get $35 OFF your purchase of each pair when you buy two pairs or more. Get an additional discount when you opt to add a tire chain accessories kit with your purchase of each pair of tire chains. Select "Kit" to get this additional promotional offer. The chart below shows what's included in the promotion and its respective pricing for each tire chain accessory in the kit. NOTE: Kit includes the following items in the quantities shown in the chart above. 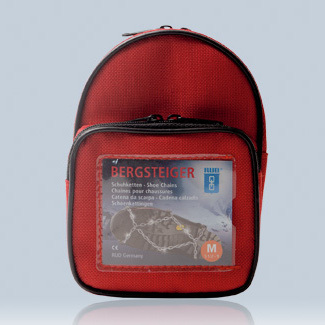 If you've ever tried walking on packed snow or icy ground, you know it can be a little difficult and sometimes even dangerous. 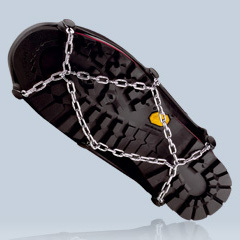 RUD's Bergsteiger shoe chains are Chain STOP's top choice for outdoor shoe traction. Whether on snow or ice, these bad boys will give you a whole lot of grip! The Grip 4x4s are strong, but in the uncommon instance that the rubber on a hook snaps, extra tensioning hooks are an inexpensive backup to have. 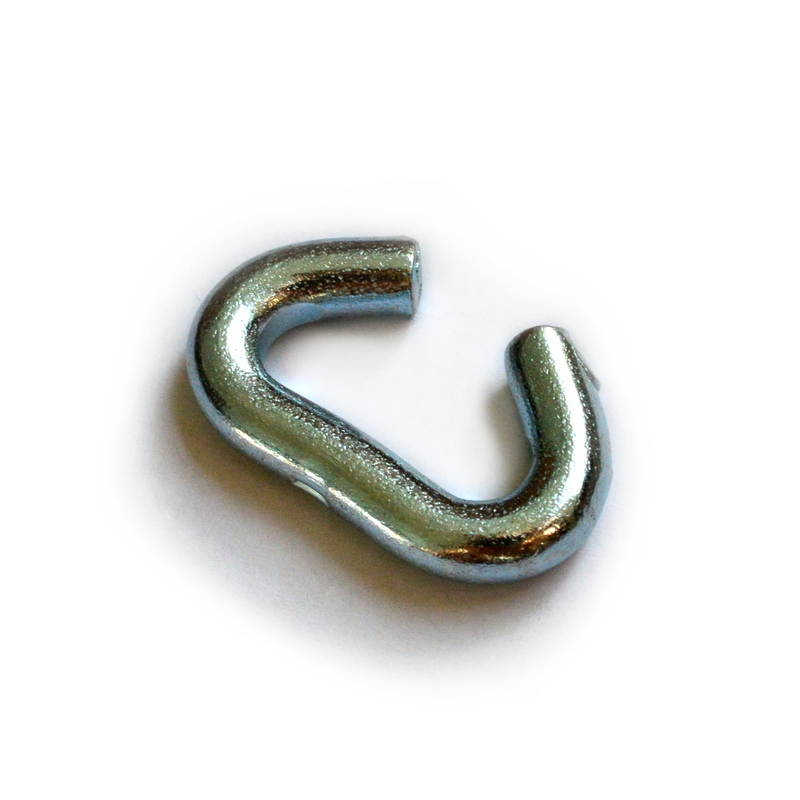 Repair links also serve as backup in the uncommon instances of a chain link breaking or when you simply need to tighten chains that are a little big. The "Shoe Size" options are ONLY FOR KITS. If you only want to buy snow chains, simply select "None" in the shoe size drop-down menus. If you indicate a shoe size when you have not indicated that you want one of the kits, you will only receive tire chains. Your selection of a quantity of 1 means you are buying 1 of the promotional option that you selected. Your selection of a quantity of 2 means you are buying 2 of the promotional option you selected. Etc. If you want 2 pairs of chains, but only 1 kit, simply select a quantity of 1 pair of the tire chain size that fits your tire, then select 1 kit and indicate shoe sizes for your shoe chains. Then, add to cart. Next, click the "continue shopping" link. This will enable you to return to the product page to select and add to cart your 2nd pair of tire chains without having to buy a 2nd kit. IMPORTANT SIDE NOTE: If your purchase is for a 4-wheel drive or all wheel drive vehicle, professional driving trainers (e.g., Bill Burke and Harald Pietschmann) strongly recommend the use of chains on all four tires. If you end up buying only one pair for a 4-wheel drive anyway, then consider strategic placement as described in detail by Harald Pietschmann. If you buy one pair for a 2-wheel drive, then put your chains on the tires that are on the drive axle. When you reach checkout, please know that the shipping and handling price reflects the relatively heavy weight of the package(s). Before purchasing tire chains, please be sure to check with your vehicle manufacturer/owner's manual as to whether your vehicle can have tire chains installed and if so, what the clearance requirements are. This will help you avoid damaging your vehicle. While these are labeled "Grip 4x4" chains, please know that care must be taken to not push the chains' limits. RUD states, "Chains are designed to aid in traction on snow and ice. They are not designed for mud, logs, or rocks, which could damage the snow chain. Please apply common sense." Chain STOP takes this to mean that driving on snow-covered "off road" trails where logs and rocks may be concealed could put your chains at risk of breaking and subsequently damaging other parts of your vehicle. While these chains are stronger and offer better traction than the average chains, please exercise great care to not drive over objects that can break your chains. Rest assured that, unlike brick and mortar stores, we DO accept returns if your tire chains do not fit. If your chains are a little to big, one option may be to try RUD's instructions for shortening the chains with repair links. Alternatively, we can give you a full refund on the price you paid for the chains. Please read our complete refund policy before purchasing. … RUD GRIP 4X4 TIRE CHAINS INFO. “Quick-connect” for easy installation – nearly 100% within 1 or 2 minutes per tire. RUD Grip 4x4 chains are designed to fit the tires of light-duty trucks, including off road 4x4s and SUVs. They are made of steel alloyed with manganese (AKA “mangalloy”) to yield a product that is extremely hard and incredibly resistant to abrasion and corrosion. Additionally, the 4.5mm thickness of their chain links makes them among the most durable snow chains of their class. While not recommended for snow plowing due to the great torque applied in that application, these chains are nonetheless durable enough to withstand normal highway/street driving as well as well-maintained fire roads. Please just exercise great caution to not drive over logs and rocks, which increase the chances of breakage/damage. The Grips are the top choice tire chains for search and rescue teams. These chains are also reversible, another feature that keeps them lasting longer than many other chains. Be sure to follow the instructions in our video below. While the chains are reversible, it is preferable to install them the exact same way we do in in the video so that the hooks that hold together the outer sidrerail sit with their flat side on the sidewall. The sharp side of those hooks could rub up against the sidewalls of your tires enough to create deterioration and wear on the sidewalls. The diamond pattern of the Grip 4x4s offers much better traction, providing slip resistance in all directions. Compare this to the cable tire chains or the link cable chains. Their respective cables and chains lay only laterally across the tire tread, offering less resistance against any side to side movement of your vehicle. Older versions of tire chains used to require that you spread them out and lay them on the ground to hopefully drive on top of them well enough to connect them within a few adjustments and then continue along. 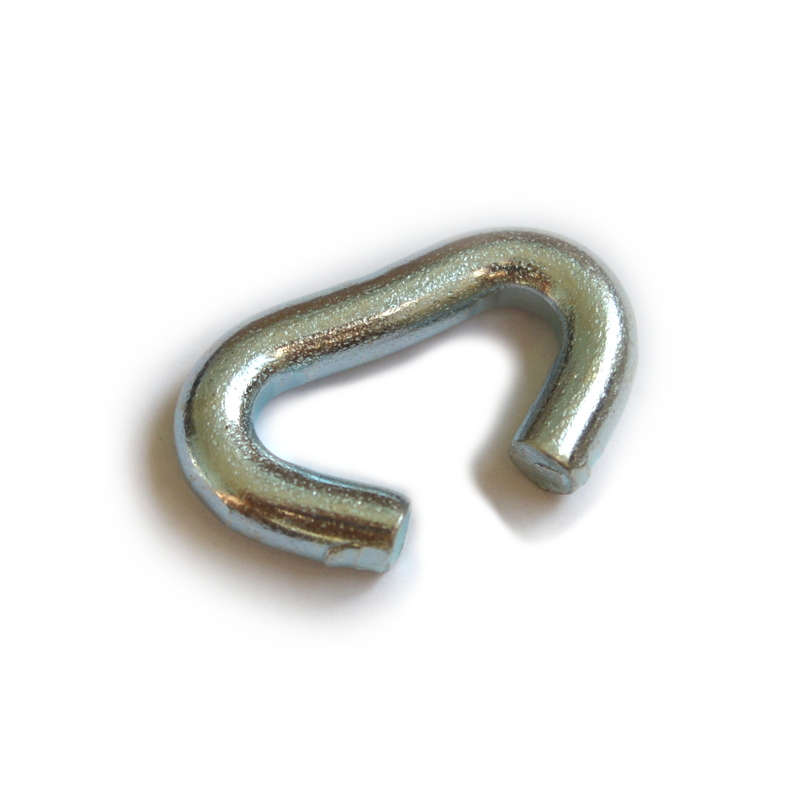 For the inexperienced, this task could prove frustrating and would often require several attempts; it still does with chains that are not the quick connection type. With the RUD Grip 4x4s, you only need to guide a wire cable to the back of your tire and then connect it over the top so that the chain mesh can then sit draping over the tire. From that point, you only need to center the chain mesh over the top of the tire and then guide a final unconnected stretch of chain that lies toward the bottom through a few points along the outer edge of the chain mesh. This enables you to tighten the mesh around the tire for a final adjustment with a tensioning hook that comes already attached to the chain mesh. You can install one chain mesh per tire in about one minute, but you should practice before you go for your drive in the snow. It will help you minimize any unnecessary amount of time you would waste in the cold, wet weather. World-renowned off road trainer, Bill Burke, also recognizes how easy these chains are to install. It was at SEMA (Specialty Equipment Market Association) many years ago where he first saw the RUD Grip 4x4s and was able to compare them to several other tire chains. His conclusion was that the Grip 4x4s are the easiest chains to install on tires, and he has been an avid user since. Visit his website or simply click on the hyperlink to read Bill Burke’s article about off roading in the snow and also about his opinion of the RUD Grip 4x4 tire chains. Fits with vehicles requiring only a Class U or Class W wheel clearance requirement of the Society of Automotive Engineers (SAE), but not class S. CHECK WITH YOUR VEHICLE'S MANUFACTURER to ensure that tire chains are appropriate for use with your vehicle. You can read more about the SAE's wheel clearance designations at the Wikipedia entry for snow chains. The RUD Grip 4x4 chains are also known as the “Compact Grip V” (not to be confused with simply “Compact Grip” chains made for sedans/passenger cars). Please note that “tire chains” is often mentioned interchangeably with “snow chains,” but know that an entirely different kind of tire chain may be used for the protection of tires, rather than traction, in industrial applications. Among the simplest tire chains on the market, the RUD Grip 4x4 tire chains are extremely popular for everyone from off roading gearheads and search and rescue teams to normal everyday vehicle owners like you and me. Watch this instructional video to learn how to efficiently install these truck tire chains in just a few simple steps. These chains are available at chainstop.com. Excellent Customer Service and Perfect Fit! Thank you Alvin! These are my first snow chains for my Land Rover, LR4 tire size 255/50 20. Called Chainstop and talked to Alvin. Great guy! He made sure my order was shipped the day I placed the order. They arrived on time as promised, 4 days. Fit perfect and easy to install. Now I'm ready for my road trip to Mammoth and then to Lake Tahoe. Pretty standard and quick install. No mishaps along the way meant chains served purpose and let me focus on what mattered - fun with family. I love these chains and hoped to keep using them this winter. Last winter I drove with these chains and did very well in snow and on ice. That was before the tensioner broke and well caused a lot of damage to my truck. The tensioner has now broken on three of the four chains I have for my truck. Replacements would not be so bad to purchase but with 12 bucks or more for shipping for a single set, I might have to go another route for my winter expeditions. I'm not much one to endorse products and companies, but when Alvin asked me for a review, I had no problem doing that. The guy's a cool dude. willing to bend over backwards to make a customer happy. I asked him a bunch of questions about installation because the instructions didn't seem too easy to follow, and I thought the chains just didn't fit at first. He quickly replied my e-mails and was fully available to answer all my questions over the phone when I called multiple times for clarification. At no point was he annoyed or did he make me feel like he was in a rush to move on. He knew to put me at ease by offering the refund option up front in the conversation rather than to have that question lingering. He's a class act that gave me reason to trust him again. Putting these on was a snap. Haven't taken them to the snow yet, but I like what I see so far. After seeing all these reviews and things I've read in forums and other websites, it wasn't hard to decide to buy these chains. It's true what they say...they're quality chains that do the job for a long time at a price that's not that expensive compared to other chains of similar quality. I'm a return customer like a few other people that have written reviews here it seems. I only shop online places I know will stand by their product and offer good service. My sister chanced on this site in a forum and came here to get her chains based on the good things she had heard about the chains. She loved them and found them easy to deal with. My experience has been the same. Putting them on was a snap and the chains weren't that expensive given other stuff I found online that are considered in the same class as these chains. Alvin over there at Chain STOP is easy to get a hold of and is thorough in his answers to questions. Getting another pair this year wasn't hard to figure out since I had such a great experience with these chains and this online shop. I knew I'd get what I needed. Quick shipping. Haven't driven with the chains yet, but they look good and fit my tires well.